Charles Ryan’s distinguished financial career combines top level expertise and deep knowledge of both Russian and international markets. Mr. Ryan began his professional career in 1989 with CS First Boston where he was a financial analyst. From 1991 to 1994, Mr. Ryan was an Associate and Principal Banker with the European Bank for Reconstruction and Development in London, where he played a crucial role in the city of St. Petersburg’s privatization program for industry and real estate. In 1994, Mr. Ryan co-founded United Financial Group (UFG), and as CEO steered UFG to become one of Russia’s leading investment companies. UFG Asset Management was founded as part of the United Financial Group in 1996. In 2005, Deutsche Bank acquired 100% of UFG’s investment banking business, Charles Ryan was appointed Chief Country Officer and CEO of Deutsche Bank Group in Russia. UFG Asset Management remained independent. 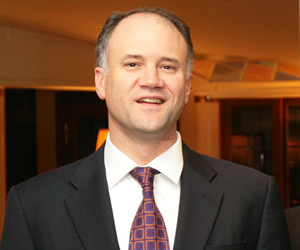 In August 2008 Mr. Ryan stepped down as the CEO of Deutsche Bank in Russia and in October 2008 became the Chairman of UFG Asset Management, which today is one of the leading Russian region focused alternative asset managers with $2.3 billion of assets in public markets hedge funds, real estate/agriculture, traditional private equity funds, and separately managed accounts. In addition to his role as Chairman of UFG Asset Management, Mr. Ryan is also responsible for the overall management of UFG’s private equity business. UFG AM is also the general partner of one of Russia’s first pure VC funds, Almaz Capital Partners, which invests in Russian technology and innovations. Mr. Ryan graduated with honors from Harvard College in Government.